Polydactyly or syndactyly can also be found in combination with brachymetatarsia. Any associated problems will need to be addressed either before or during treatment of the short toe. Brachymetatarsia has a much higher prevalence in women than men, at a ratio of 25:1. Patients with brachymetatarsia are often bothered by a difficulty in wearing shoes, pain, and aesthetic complaints. Patients also often have difficulty walking. 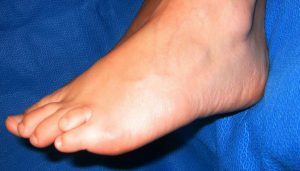 During normal walking, weight is distributed from the fifth toe, to the fourth, to the third, and so on to the first toe. This happens because the toes are progressively longer going from fifth to first. If one of the toes is shorter than the one preceding it (e.g. the fourth toe), this will disrupt the weight-sharing process. As a result the toes on either side of the shortened toe (e.g. the third and fifth toes) must bear increased weight, resulting in pain and gait difficulties. The shortened toe also tends to drift upwards, which can make it difficult to wear shoes.